The last two aliases are helpful if you're used to editing files from the command line using vi(m). This will open file somefile and set cursor on line 1234. Certainly the best way to understand how Prelude enhances the default Emacs experience is to peruse Prelude's source code (which is obviously written in Emacs Lisp). Understanding the code is not necessary of course. Prelude includes a prelude-mode minor Emacs mode which collects some of the additional functionality added by Prelude. It also adds an additional keymap that binds many of those extensions to keybindings. C-x O Go back to previous window (the inverse of other-window (C-x o)). C-^ Join two lines into one(crux-top-join-line). C-x p Start proced (manage processes from Emacs; works only in Linux). C-x M-m Start your default shell. C-x C-m Alias for M-x. M-X Like M-x but limited to commands that are relevant to the active major mode. C-h A Run apropos (search in all Emacs symbols). C-h C-m Display key bindings of current major mode and descriptions of every binding. M-/ Run hippie-expand (a replacement for the default dabbrev-expand). C-x C-b Open ibuffer (a replacement for the default buffer-list). F11 Make the window full screen. F12 Toggle the Emacs menu bar. C-x g Open Magit's status buffer. C-x M-g Open Magit's popup of popups. M-Z Zap up to char. C-= Run expand-region (incremental text selection). C-a Run crux-move-beginning-of-line. Read this for details. C-c o Open the currently visited file with an external program. C-c g Search in Google for the thing under point (or an interactive query). C-c G Search in GitHub for the thing under point (or an interactive query). C-c y Search in YouTube for the thing under point (or an interactive query). C-c U Search in Duckduckgo for the thing under point (or an interactive query). C-S-RET or Super-o Insert an empty line above the current line and indent it properly. S-RET or M-o Insert an empty line and indent it properly (as in most IDEs). C-S-up or M-S-up Move the current line or region up. C-S-down or M-S-down Move the current line or region down. C-c n Fix indentation in buffer and strip whitespace. C-c f Open recently visited file. C-M-\ Indent region (if selected) or the entire buffer. C-c u Open a new buffer containing the contents of URL. C-c e Eval a bit of Emacs Lisp code and replace it with its result. C-c s Swap two active windows. C-c D Delete current file and buffer. C-c d Duplicate the current line (or region). C-c M-d Duplicate and comment the current line (or region). C-c r Rename the current buffer and its visiting file if any. C-c t Open a terminal emulator (ansi-term). C-c k Kill all open buffers except the one you're currently in. C-c I Open user's init file. 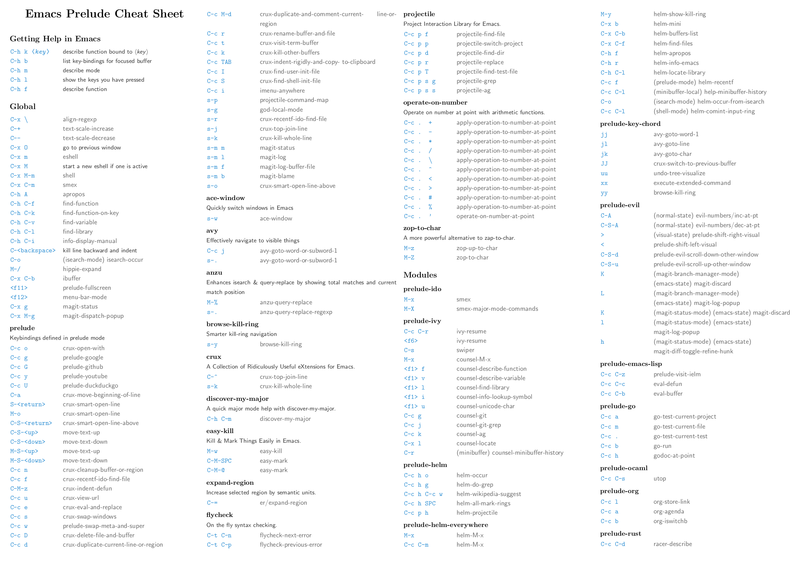 C-c S Open shell's init file. C-c . + Increment integer at point. Default is +1. C-c . - Decrement integer at point. Default is -1. C-c . * Multiply integer at point. Default is *2. C-c . / Divide integer at point. Default is /2. C-c . \ Modulo integer at point. Default is modulo 2. C-c . ^ Power to the integer at point. Default is ^2. C-c . < Left-shift integer at point. Default is 1 position to the left. C-c . > Right-shift integer at point. Default is 1 position to the right. C-c . # Convert integer at point to specified base. Default is 10. C-c . % Replace integer at point with another specified integer. C-c . ' Perform arithmetic operations on integer at point. User specifies the operator. For various arithmetic operations, the prefix C-c . only needs to be pressed once for the first operation. For subsequent operations, only the appropriate operations (i.e. +, -, *, /... needs to be pressed). Prelude does not mess by default with the standard mapping of Command (to Super) and Option (to Meta). You can also temporarily swap them with C-c w (M-x prelude-swap-meta-and-super). The Emacs Mac port comes with Command set to Meta. I'd highly recommend to all macOS users to consider remapping Return to Control instead. That's an epic productivity boost and it's not as crazy as it sounds! Projectile is one of the essential packages bundled with Prelude. It provides an easy way to navigate and switch projects. Take a look at its extensive documentation to get a feel for everything you can do with Projectile. Prelude adds an extra keymap prefix s-p (s stands for Super) in addition to the standard one C-c p. By default on Windows keyboard Super is mapped to the Windows key and on macOS keyboards Super is mapped to the Command key. Alternatively you can just press s-p and wait for a moment for which-key to kick in and show you the available keybindings. You can learn Helm usage and key bindings following the guide. C-c h is Prelude's default prefix key for Helm. If you don't remember any key binding, append C-h after C-c h for a list of key bindings in Helm. M-x Run helm-M-x, an interactive version of M-x. M-y Run helm-show-kill-ring, shows the content of kill-ring. C-x b Run helm-mini, an interactive version of C-x b with more features. C-x C-f Run helm-find-files, an interactive version of find-file with more features. C-h f Run helm-apropos, an interactive version of apropos-command. C-h r Run helm-info-emacs, an interactive version of info-emacs-manual. C-h C-l Run helm-locate-library that can search for locations of any file loaded into Emacs. C-c C-l Run helm-comint-input-ring that shows shell history using Helm interface. C-c C-l Run helm-eshell-history that shows eshell history using Helm interface. If you prefer Ido in everywhere, you should not add prelude-helm-everywhere, so you can use Helm along with Ido and Prelude's default commands. You can always reactivate Helm with (prelude-global-helm-global-mode-on). In helm-M-x, you have to pass prefix argument AFTER you run helm-M-x, because your prefix argument will be displayed in the modeline when in helm-M-x buffer. Passing prefix argument BEFORE =helm-M-x= has no effect. Key-chords are available only when the prelude-key-chord module has been enabled. If you want to use vim keybindings inside of Emacs enable the prelude-evil module which provides support for evil-mode. Use C-h k <key> (<key> are the ones listed on the left) or C-h f <function> (<function> are the ones listed on the right) to see the detailed explanation. The default Prelude installation comes with a bare minimum of functionality. It will however install add-ons for various programming languages and frameworks on demand. For instance - if you try to open a .clj file clojure-mode, cider and Prelude's enhanced Lisp configuration will be installed automatically for you.